Henry Holt and Co. (BYR), 9780805081695, 40pp. Jenny Sue's eyes are not the same as other people's eyes. Her right eye looks in one direction, while her left eye sometimes wanders. Jenny Sue has a travelin', lazy eye. Although it makes her different, it also helps her see the world in a special way. Here is a charming story about one very inspiring little girl who overcomes her disability and offers inspiration to others. 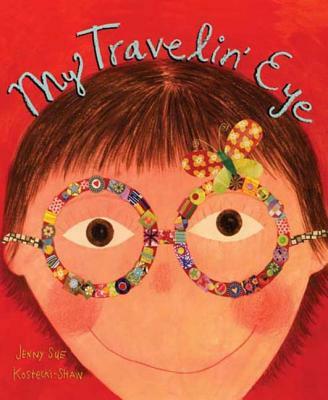 My Travelin' Eye is a 2009 Bank Street - Best Children's Book of the Year. Jenny Sue Kostecki-Shaw is the author and illustrator of My Travelin’ Eye. She is a freelance illustrator who studied at the Kansas City Art Institute and The Illustration Academy. She lives in the mountains of Northern New Mexico with her family.